If you’re heading into the horizon in search of adventure, you need to be well-equipped. Your gear needs to be as versatile and ready as you are when the pavement ends and the terrain begins to change. Of course, adventure is in the eye of the beholder. Some may prefer more dirt mixed into their cup while others may be perfectly content staying the paved course. The key for choosing the best adventure motorcycle gloves is understanding what kind of adventure you plan to have and choosing the best option (or two) for your needs. 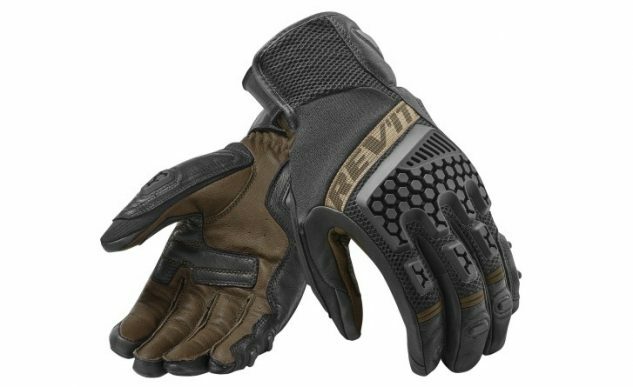 We’ve put together a list of adventure motorcycle gloves that runs the gamut from off-road focused to waterproof, leather and everything in between. If you plan on taking your 500-plus pound motorcycle off-road, you had better plan on working hard once the riding gets difficult. Even on dedicated dirtbikes it doesn’t take much to work up a sweat when riding technical terrain. 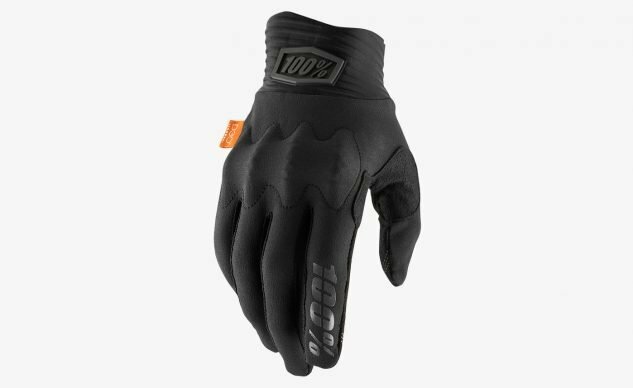 The 100% Cognito glove represents the off-road end of the spectrum when it comes to adventure riding. The D3O knuckle guard gives additional protection should the odd branch make it past your handguards or in the case of the inevitable tip over. The four-way stretch material on the top allows for maximum mobility, while the Clarino palm complete with silicone grip-enhancing graphics provides a durable and comfortable grip on the bike. A hook-and-loop-type Velcro closure combined with a neoprene cuff gives a positive and comfortable fit. 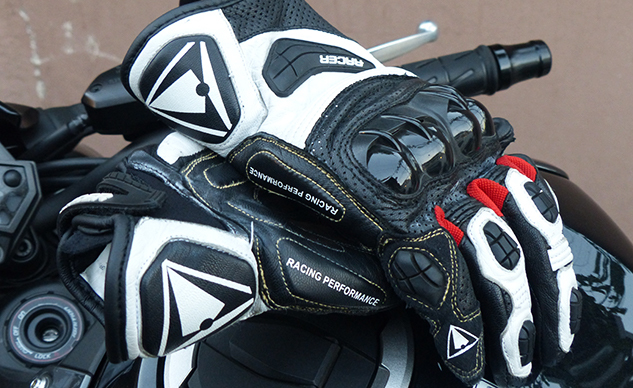 If you’re wrestling an adventure bike in the tough stuff, the 100% Cognito may be the glove you’re looking for. Adventure gloves should mean never having to turn around, right? Well, that’s what the Alpinestars Belize Drystar glove is all about. Whether you encounter cool temps, wet days, or difficult terrain, the Belize will have your back… er, hands. The Belize Drystar uses a sealed Drystar membrane for waterproofing with a leather outer for maximum abrasion resistance. Adding to the protection are TPU sliders found on the middle two digits as well as the palm and a solid matte carbon knuckle slider. The Belize also has localized perforation to provide better breathability from the Drystar membrane. The impact protection, leather construction, and waterproofing make the Belize Drystar a great option for all sorts of travel. 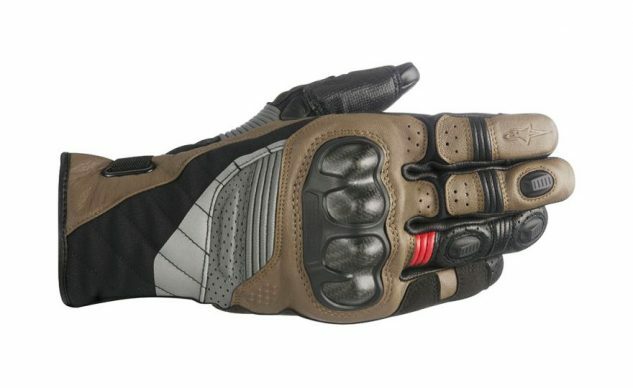 The Fox Bomber gloves have been a staple of Fox’s off-road lineup for many years. The Bomber combines perforated goatskin leather with a breathable textile chassis to provide a durable yet breathable glove for whatever the trail has to throw at you. The Clarino palm has double layers in high-wear areas as well as silicone graphics for additional grip on the index and middle fingers. While they may only look like carbon fiber, the polycarbonate sliders on both the knuckles and fingers provide excellent impact and abrasion resistance. The Fox Bomber is a glove that lands nicely in the middle between street and dirt giving a versatile solution for both, and if you’re a KTM fan, you can get it with bright orange polycarbonate sliders and accents. 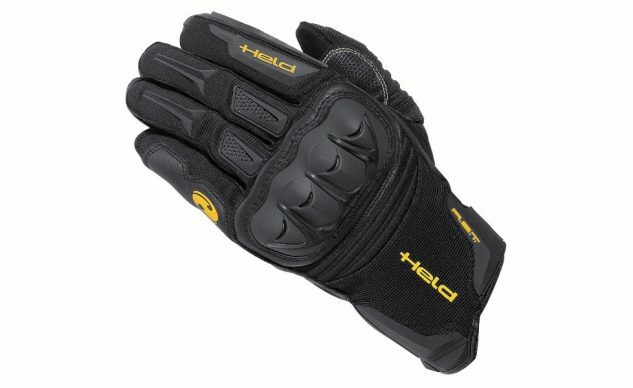 The Sambia glove from Held is a comfortable yet protective offering from the German company. The palm of the glove is made up of goatskin and kangaroo leather for tactile user response as well as superior abrasion resistance. The edge of the glove, which is most likely to hit the ground first, is reinforced with Superfabric for an additional layer of built on protection. The upper portion of the glove is made up of a breathable stretch polyamide with rubber inserts for impact absorption throughout as well as a hard plastic knuckle protector. A great option for warm weather ADV rides. “Built to meet the demands of the the intercontinental adventurer” says KLIM. The Badlands Aero Pro shares the same name as the company’s flagship adventure jacket/pant combo which has been used around the world by serious world conquering ADV riders. The Badlands Aero Pro is made up of perforated goatskin leather as well as KLIM’s DWR Rodeo leather. On the knuckle and palm KLIM is using its Poron XRD material which provides similar characteristics to the D3O used in the Badlands jacket and pants. 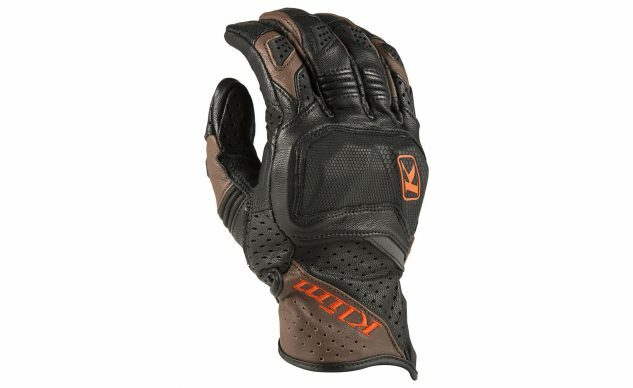 Over the top of the knuckle is KLIM’s own version of Superfabric for abrasion resistance. The Aero Pro glove also has a few creature comforts such as the visor wiper on the left index finger, large loops for pulling the gloves on, and a small snap to connect the gloves when you’re not using them. 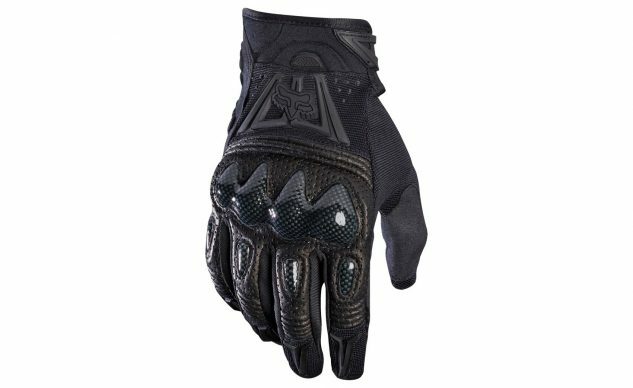 Whether you’re matching it to your Badlands kit or simply looking for a bada** glove, check out the Badlands Aero Pro Short Glove from KLIM. Austrian-based Racer gloves are known for their comfort from day one and the Sprint is no different. 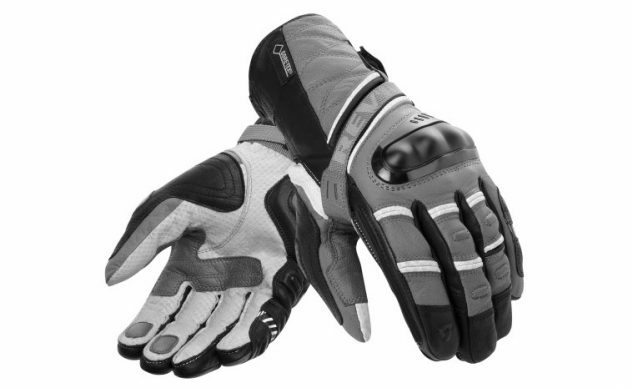 The perforated goatskin chassis makes for a soft extremely comfortable glove that gets better with time. The Sprint’s rubber finger sliders, plastic knuckle protector, and padded palm add extra protection to the Sprint’s supple leather construction. With textile stretch panels between the fingers, the fit and breathability of the Sprint are top notch. Check out our full review for a more in depth look at the Racer Sprint. An all weather option from the Dutch company, the REV’IT! Dominator GTX use Gore-Tex technology as well as Gore Grip to ensure your hands stay warm and dry no matter the conditions. The outer of the Dominator GTX is made up of a few different technical leathers. Goatskin leather that has been drum-dyed with a WR finish is used to provide a soft supple leather while the WR finish gives the goatskin water-repellent and soil-resistant properties without altering its natural look, feel, or breathability. Pittards WR100X Hairsheep Diamond leather is also used which provides excellent waterproofing and perspiration-resistance allowing the leather to stay soft and supple rather than getting stiff upon drying. Not to mention it provides great grip while wet. 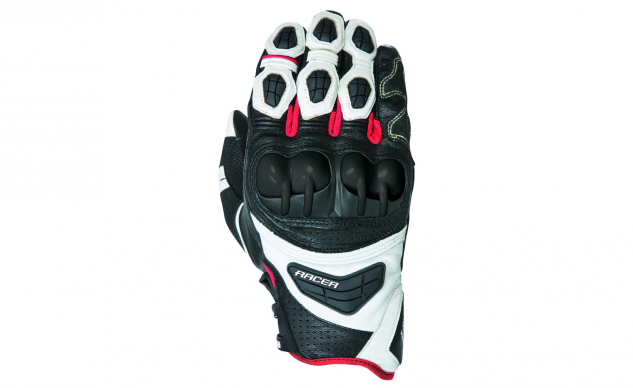 In addition to the technical leathers used, hard sliders can be found on the fingers as well as full knuckle protection. The Dominator GTX is meant to provide excellent weatherproofing and protection no matter what type of adventure you throw at it. The REV’IT! Sand 3 is a fantastic warm weather glove that allows for great articulation, substantial breathability, and all day, week, or month comfort. The Sand 3 is made up of goatskin leather on the palm, touch screen compatible finger tips, air stretch mesh, Automan stretch fabric (not to be confused with the antiquated Ottoman stretch fabric), and PWR|shell 500D stretch. TPR impact protectors are found throughout the fingers, outer edge, thumb, palm, and knuckles and are all pliable to add to a protective yet comfortable fit. We’ve put plenty of miles in the Sand 3 and they are some of our favorite go-tos for adventure riding. 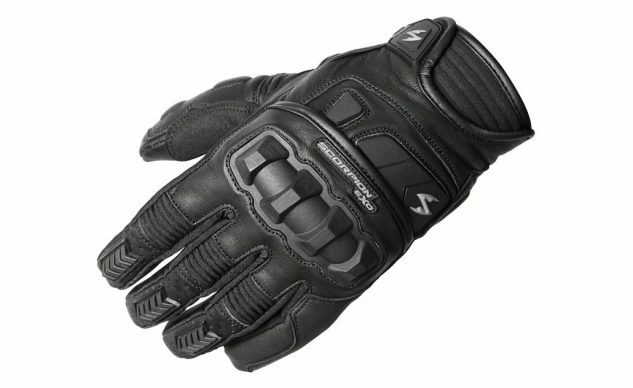 The Scorpion Klaw II is a short cuff leather glove that punches well above its price point. The Klaw II is made up of goatskin and neoprene giving it a supple comfortable feel with TPU knuckle protectors and rubberized impact protectors on the fingertips. On the palm, Calrino is used for tactile grip on the controls and dense foam provides extra impact absorption. A great option for street-heavy budget-minded ADV riders. 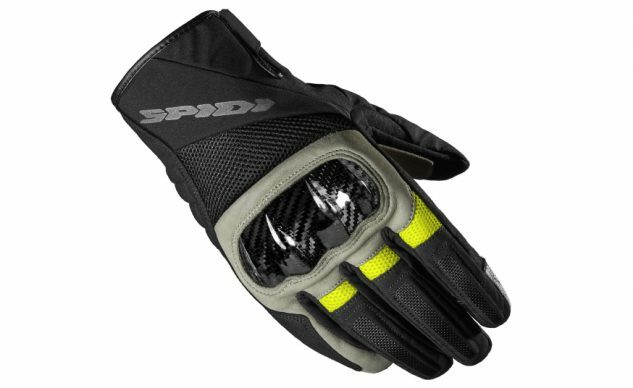 The Spidi Bora H2Out provides a lightweight, waterproof adventure glove for those moist Spring rides. The Bora H2Out uses Spidi’s own H2Out to provide a waterproof, windproof, yet breathable membrane and combined with a 100g insulation, this glove is great for cooler weather. The goatskin leather, carbon knuckle, and reinforced padding throughout keep the Bora H2Out lightweight, yet protective, while also being waterproof and insulated. A great all-rounder for your ADV gear stable.